This April 9th, the expulsion of the ZAD of Notre-Dame-des-Landes began. If the proposed airport for the region was struck down, the french government has repeatedly announced that it will not accept the “illegal” occupation of the land by squatters. Some 2,500 military police, with heavy equipment and demolition vehicles were mobilised for the occasion, for an estimated 250 people occupying some 40 structures. If the forces of the State seem excessive, the language of the government leaves no room for doubt as to the motives. Between the lines, it does not take a great deal to see what is in fact at stake. The so called “radicals” are not only those people, all of the people, who have resisted successfully the construction of an airport (in a fifty year struggle), and thus the saving of a way of life and its associated environment, but they are as well those who have experimented with autonomous forms of life, and it is this that must be destroyed and erased. The law, and the creation of the leveled space of “normality” in which the law can function, revels itself as thereby grounded in the “exception” of violence, which is in fact itself the norm. The ZAD of Notre-Dame-des-Landes resonated across france, and beyond. And whatever its fate today, it stands as an example of what a radical anti-capitalism can be. Kept at bay for years by the movement, a new attempt at eviction of the residents of the ZAD at Notre-Dame-des-Landes has begun. Starting at 3 a.m. today, the operation began deploying in all its brutality: Interminable lines of blue police vans, armored vehicles, tear gas, the first injuries and the first arrests. Gendarmes announced that reporters were strictly forbidden “throughout the operation” and blocked their access to the site. They declared that the press was prohibited from taking photos and that the media would have access only to images supplied by the Gendarmerie. The expulsions confirm the government’s pretense of re-establishing the rule of law while in fact grossly flouting the law. The Prefecture has not even granted the inhabitants of the ZAD access to the minimum guaranteed by the law on the right to housing, in this case the right to individual procedures and the right to contest an eviction decision. Yet the residents of most areas within the ZAD have identified themselves by name on several occasions over the past few years. The Prefecture’s outrageous duplicity is visible today in all its hypocrisy: After announcing it would seek a “serene and peaceful evolution of the situation” it sends 2,500 police/army to destroy residents’ homes. We are told that a selection will be made on the basis of categories that are pure fiction and have no bearing on anything but the needs of the repressive storytelling the government has locked itself into. There is no false division here between radicals on the one hand and farmers on the other; what exists are a number of different and intertwined ways of sharing this land. Contrary to what Gérard Collomb [Minister of Interior] claims, in fact no one has been individually legalized over the recent weeks at the expense of the others. The movement as a whole has proposed a framework for a collective agreement involving all residents and all their projects. But the government could not simply admit that the proposed airport was useless; they were bent on taking revenge against those who had forced the abandonment of the project. The land is dying, the most brutal forms of economic processes are atrophying our lives, and everywhere, people aspire to alternatives to that situation. On February 10, 30,000 people had committed to supporting the future of the ZAD. But the government’s political message is very clear this morning: It will allow no possibility for spaces where alternative experiments can take place. Our anger at the terrible waste the destruction of the houses and living spaces we have built here represents is profound this morning. Our emotion at the idea that the collective experiment that is the ZAD can be endangered by a police/army assault is strong. But the ZAD will not will disappear because of this. We live here, we have roots here in this countryside, and we shall not leave it. We salute the courage of the people who have already joined us on the site and have answered our calls. In 2012, the government’s destructive arrogance ultimately turned against it. In the current context of widening strikes, demonstrations, and occupations throughout the country, we believe that the razing of Notre-Dame-des-Landes will become a new engine of a revolt that will take hold. This destructive operation will turn against its perpetrators. We call on all those who can join us now or in the next few days to come to the ZAD. More than 80 assemblies are already planned all over France this evening, including in Nantes and Rennes at 6 PM. The response to these expulsions will also extend over time. A demonstration has been called in Nantes on Saturday and a convergence on the ZAD is being organized for this weekend. The police and military evacuation of some of the residents of the ZAD of Notre-Dame-des-Landes should begin in the next hours. In the midst of a broad social movement, this intervention does not surprise us. We are convinced that these struggles – to defend the ZAD, the SNCF, truly open universities or authentically human policies of hospitality and welcoming migrants – are linked to each other, and that they participate in the same movement. 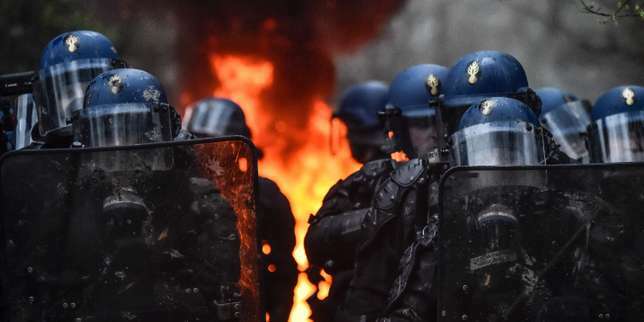 The police and military evacuation of some of the inhabitants of the ZAD of Notre-Dame-des-Landes seems more and more likely, and should begin in the coming hours. The first historic victory of the fight against the airport, which the government was forced to abandon on January 17, opened a new phase in the struggle around the issue of the future of the ZAD. Since then, Emmanuel Macron, Édouard Philippe and Gerard Collomb have seemed determined to close the history of the struggle for this territory. For this, the government first played (and continues to play) with division, trying to convey the idea that some of the occupiers would have no legitimacy to remain in a territory that they have, however, directly helped to protect against concrete and airplanes. Since 2013, the movement as a whole has affirmed its willingness to collectively manage the lands of the ZAD, which the government now refuses, and which it now threatens with expulsion, with an eagerness that nothing justifies. Faced with this risk of evictions, we reaffirm our unwavering solidarity with all of the inhabitants of the ZAD, regardless of their status, regardless of their home, whether they have a title deed or not, etc. The choice of the government to proceed with the evacuation operation in the midst of a full social movement – at the SNCF, in the civil service or in the universities (not counting the many other mobilizations in progress) – does not surprise us. An evacuation operation will, of course, reinforce the growing rejection and shared policies of Emmanuel Macron. But the government is no doubt betting that it will manage to use the multiplication of fronts to divide the current mobilizations. We must therefore build ever stronger alliances and oppose this aberrant military operation, which mobilizes at least 2,500 military and 1,500 police officers to violently evacuate an area where resilient and sustainable ways of life are being created. We are convinced that these struggles – to defend the ZAD, the SNCF, truly open universities or authentically human policies of hospitality and welcoming migrants – are linked to each other, and that they participate in the same movement. Among the many things we can learn from the fight against the airport of Notre-Dame-des-Landes and its world, the diversity of strategies, approaches and alliances deployed on the ground that made possible the extension of the occupation through time appear to us decisive. Moreover, the recent examples of the concrete and active solidarity of the inhabitants of the ZAD with the actors and actresses of the struggles of this territory in Nantes constitute a strong and concrete example of the convergence of the struggles. Beyond that, what is at stake in Emmanuel Macron’s Thatcherian gesture is widely shared, whether one lives in the ZAD, is a railroad worker at the SNCF, a public servant threatened by job cuts, a student crushed by the abandonment of university or high school, or subject to the absurd brutality of Parcoursup [the national university selection process] or in the resistance to the deadly inhumanity of French and European migration policies. What these struggles share goes far beyond tactical inventions (exemplified by the fear openly expressed by university presidents to see “academic ZADs” open up). Emmanuel Macron and his government have embarked on the final stage of the mechanical and systematic destruction of public services (and their agents). The brutal cycle of “reforms” liberalizing these services, which is just beginning, must of course pave the way for their privatization. To be able to carry out their project, the government is prioritizing the sectors most likely to constitute durable pockets of resistance. Around the Zad, thanks to the work of its inhabitants and its residents, we have been able to fight for nearly fifty years against the airport and its world – a slogan that the inhabitants of the ZAD have made real, by their ability to create links with other resistances against other infrastructures, or by transforming these few hectares of grove into a space of reception, experimentation and resilience. Today, we must succeed in defending the ZAD, in the same way that we must succeed in defending the SNCF, the university and all the public services against Emmanuel Macron and his world – of liberalization, commodification and privatization and of concrete. We will do this, in real terms, by answering the calls for support of ZAD residents, calls for local visits or local rallies in the event of expulsion, and ensuring that our other mobilizations are also built in the name of the defense of this territory, emblematic of what our leaders can not tolerate. A battle has been engaged. Mobilisations and protests have been announced. We stand in solidarity with the ZAD and with all ZADs everywhere. To follow events, consult the french and or english language websites of the ZAD Notre-Dame-des-Landes. This entry was posted in Commentary, News blog and tagged autonomy, france, Notre-Dame-des-Landes, State and Capital, State terror, ZAD. Bookmark the permalink.